Lucy Stark, a clever, pragmatic, capable Brooklynite is the assistant to a best-selling writer named DV who has gone to Tuscany with his latest lover in search of inspiration. One morning Lucy receives a startling message: DV is dead, and the circumstances are suspicious. Soon Lucy finds herself in Italy, where her search for DV’s manuscript leads her into the thick of nefarious plots. 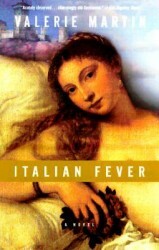 Part mystery, part romance, part meditation upon the maddening but redemptive power of art, Italian Fever is a funny, insightful portrait of the American abroad, and an irresistible exploration of our perpetual love affair with Italy.